Your party guests can jump, climb, slide, explore and discover in a unique, safe setting designed to connect kids with the wonders of plants and the great outdoors. Designed for ages 3–12. Reserve your party online today! Registration Opens February 1 at 9 am. The most up-to-date available party dates and times are listed online. Admission for up to 30 guests (children and adults) to both the Garden and Children’s Garden. Parties are required to have at least 1 adult per 5 children. Regular admission rates for the Garden and Children's Garden apply to additional guests. An additional $50 cleaning deposit is refundable when the Town Hall is left clean and in good repair when your party is over. The Garden reserves the right to retain the deposit if the Town Hall is left untidy or in disrepair. Birthday parties are available only when the Children’s Garden is open (April through October). Parties are held Saturday and Sunday only, for a two-hour period from 10 a.m. to noon or from 1 to 3 p.m. Advance reservations are required. Is the date and time I want available? Check party date and time availability online! Party hosts are encouraged to process their reservation online in order to secure the date and time. Don't see the date and time you want? Unfortunately that means that slot has already been reserved. Party dates and times that are no longer available are removed from the list of available party slots. Make sure to include adults in your party! 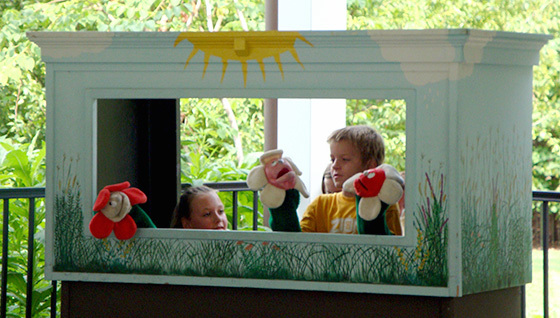 The Missouri Botanical Garden requires one adult chaperone for every five children, and the children must be attended by an adult at all times. Reserve your party online today! Reservations must be made at least ten days in advance. Town Hall rental fee and cleaning deposit are due at time of reservation. Mastercard, Visa or Discover are accepted. Download more information about birthday parties in the Children’s Garden. Call (314) 577-5185 if you have additional questions. Birthday Parties in the Children’s Garden Town Hall are held rain or shine, unless the Children’s Garden is closed due to severe weather. Should you choose to cancel your party five business days prior to your party, you will receive a full refund, minus the $50 deposit. Refunds cannot be issued for missed parties or cancellations less than five business days prior to the party. A business day is defined as Monday through Friday 8:30 a.m. to 5 p.m., no Saturdays, Sundays, or federal holidays. If the Missouri Botanical Garden must cancel your party due to inclement weather, we will work to notify you as soon as possible and try to reschedule your party or we will issue you a full refund. Free parking is available on site, subject to availability. Additional free off-street parking is available two blocks west at the corner of Shaw and Vandeventer. Plan to arrive 30 minutes before your scheduled party time to allow for parking, checking in with Visitor Services and walking to the Children’s Garden. Feel free to bring a birthday cake and child-friendly beverages (e.g. juice boxes or water). While we prohibit additional food, birthday parties are welcome to enjoy lunch in Sassafras (the Garden’s main restaurant in the Ridgway Visitor Center). Make sure to remember your serving utensils, dishes, plates, cups and table coverings. The Children’s Garden is a unique space requiring special maintenance. Please do not bring additional decorations (no balloons, tape, tacks, stickies or staples of any kind). Guests are responsible for leaving the Town Hall clean and in good repair. Can you have candles and matches? No. The Garden is a National Historic Landmark, therefore there is no smoking on the grounds and matches, candles, and fire are prohibited. Many of our birthday party guests have found creative alternatives to candles, like pinwheels or battery-operated musical candles. We appreciate your understanding! 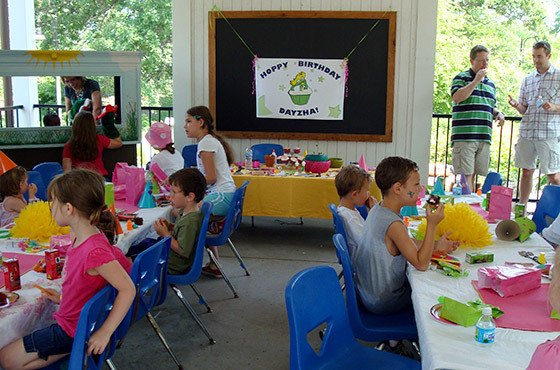 Download additional details about birthday parties in the Children’s Garden. Download More Information about Birthday Parties at the Children's Garden!